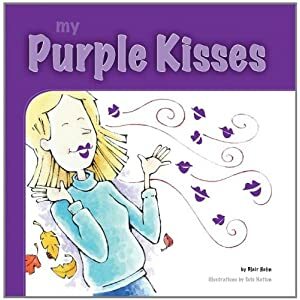 Blue Bicyle welcomes local children’s author, Blair Hahn, Fri., Sept. 9, 5-7 pm to sign My Purple Kisses and My Purple Toes (Greenleaf, hb., $15.95). These two children’s board books, illustrated by Tate Nation, tell colorful, creative stories about a mother who shares her love in a variety of purple ways. Using fun seek-and-find illustrations, the series promotes life lessons that challenge a child’s imagination and early reading skills. Written especially for ages 3-8, kids love to look for the secret ladybug hiding on each page! In addition to the booksigning, we will also have toe and lip painting at the store– purple of course! A percentage of the proceeds will be donated to Soles 4 Souls, a shoe charity for children in need. Blair Hahn is a local attorney with a passion for children. The My Purple Toes series was first inspired by his experiences with his own teenage daughter and his desire to give back to charity. My Purple Toes was awarded a 2010 Moonbean Children’s Book Award and high approval from kids and parents alike. This was written by bbb. Posted on Sunday, August 28, 2011, at 4:00 pm. Filed under Events, Uncategorized. Tagged booksignings. Bookmark the permalink. Follow comments here with the RSS feed. Post a comment or leave a trackback. ‹ Clay Rice returns to Blue Bicycle, Sept. 5! © Blue Bicycle Books All rights reserved.